Dr Foot Work Insoles are designed specifically to fit into work boots and shoes. These dynamically engineered functional insoles correct over pronation and provide comfort and relief for people who are on their feet all day. The special poron heel cushion and comfortable arch support helps to reduce shock absorption and fatigue. 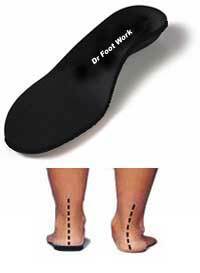 A common cause of foot pain and many sporting injuries is poor alignment of feet. Dr Foot's Work Insoles treats the underlying cause of over pronation which causes sports injuries and foot pain such as bunions, ball of the foot pain, flat feet, neuroma, heel pain and many other conditions.